What follows is a list of the recordings of Churchill speeches, many but not all of which were broadcast (as well as readings), that I have unearthed to date. In all, I have found 99 speeches and 24 readings. They include speeches intended for broadcast as well as speeches made without that original intention but recorded nonetheless. My goal has been to locate all commercially-recorded speeches, which, in principle, are relatively accessible, albeit in old analog (flat-disc) formats. Many of those broadcast were also privately recorded at the time of the broadcast. In the present day, there are of course many speeches that can also be found on YouTube or elsewhere on the Internet. In this initial listing, I have not sought to document these. 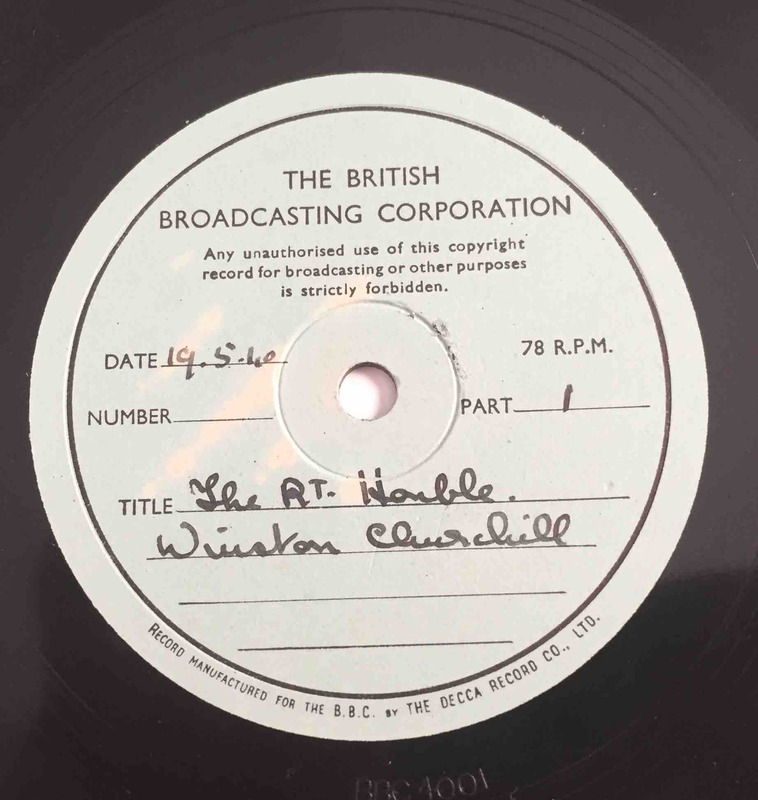 Nor have I sought to probe the unreleased holdings of the BBC, which may well be the greatest single source of Churchill speeches, although it is unlikely that these are readily accessible to members of the public. 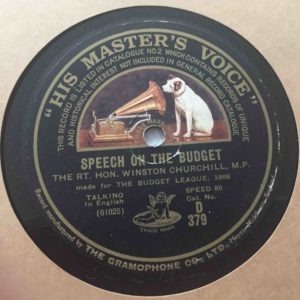 The earliest recording known to the author, one of several 1909 Churchill speeches defending the Liberal Government’s budget, and likely published anticipating the 1910 general election. 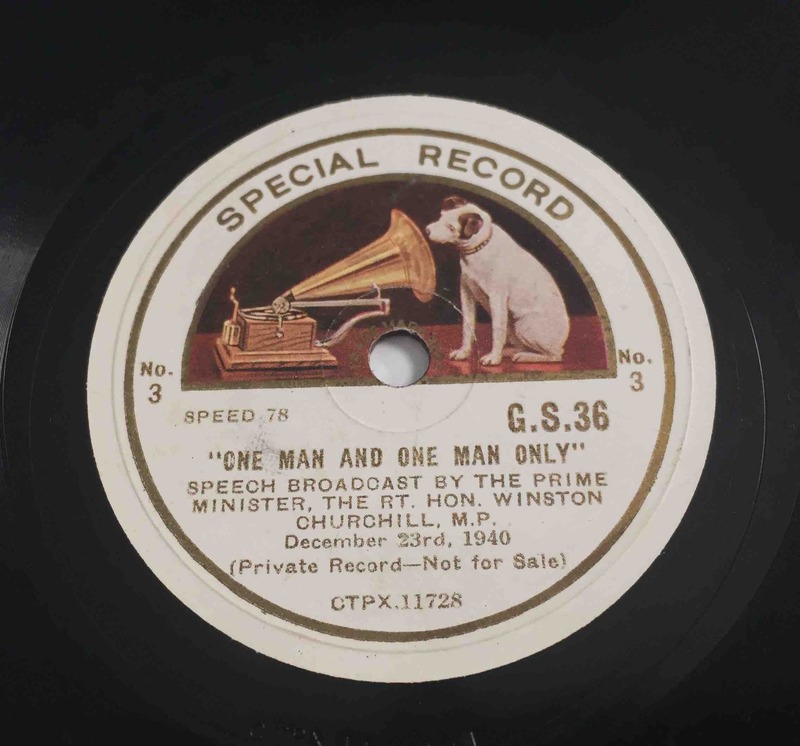 Note the speed, 80 rpm; 78 rpm was not adopted until 1925. 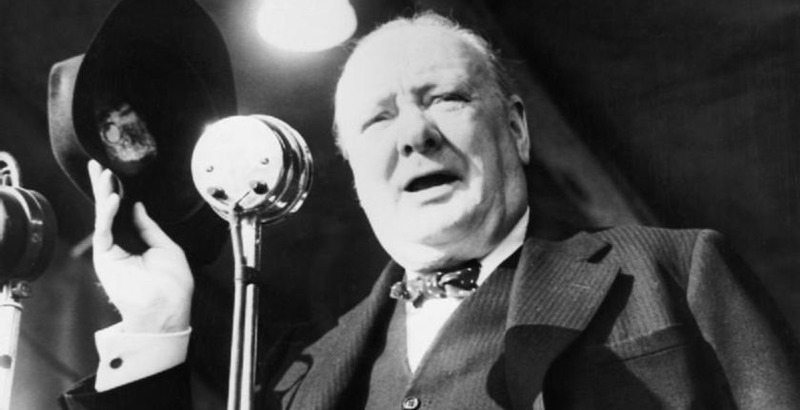 Although not speeches, Churchill’s recorded readings of sections of his Second World War, which he undertook in 1948-49 at Chartwell, are included. They evidence his own selection of material passages and they provide his own emphasis in his reading of them. Moreover, they are among the most accessible recorded documents. My source has for the moment been limited to my own audio collection, which is extensive but not likely totally complete. The list is also focussed on 78 and 33 rpm recordings, although I have included a number of tapes and CDs, and 16 rpm recordings where I have them. Note, though, that, at the time of the 1909 recording, the speed at which flat-disc records rotated was often 80 rpm, not 78 rpm. It was not until 1925 that the standard rotational speed was fixed at 78.26 rpm. There are instances in which I hold recordings of speeches that I have not found in commercially-released form. 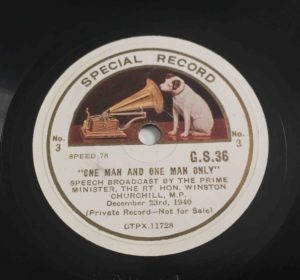 Like all those I list as “privately recorded”, these were cut on flat discs by individuals, as well as by radio stations (although fewer of those have found their way into the hands of the public). In the modern era, we have been recording off-air or in accessible venues on 1/4″ tape cassettes or CDs/DVDs. The recordings indicated as “privately recorded” may also exist in commercially-manufactured form. In some cases I list both. In many instances I do not hold a recording other than in privately recorded form. Note that the recordings of Churchill’s speeches were not included in my Bibliography of the Writings of Sir Winston Churchill. This is the only listing of recorded speeches of which I am aware. My biggest difficulty has been the selection of speeches. When I began, I hoped to limit inclusion on the list to full speeches, but I quickly realized that I needed to abandon that goal, as I have not been able to listen to each recorded track in order to verify the length of the content I have listed. And I have easily fallen prey to the temptation to include recordings of extracts of many fragmentary speeches, since such fragments constitute the only “live”, accessible audio flavour of otherwise obscure recordings. 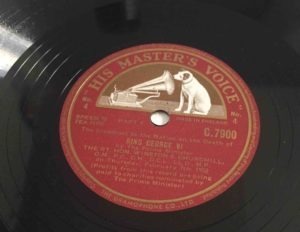 And where on a 33 rpm anthology album, or album set, there have been a number of such extracts, I have felt obliged to include on the list the references to better-known and frequently-published full recordings, even though the anthology only included extracts of those wholly-available speeches. In most cases, the speeches I have listed here have been recorded in a number of places by a number of companies and I have attempted to provide information about each of those recordings, together with the identifying letter/number of each of their records. I have included the title of the speech as given on each record. It has occasionally been the case that different companies have used different titles. In those cases, I have included each of the titles used by the recording company. Since what is common to each is the date of the speech, I provide that as the heading for each speech. And I present them chronologically. I have also included in brackets the title given to each speech by Sir Robert Rhodes James in his Winston S. Churchill: His Complete Speeches where the title differs materially from that provided by the recording company since it is that title that will generally be better known to, or easily found by, Churchillians. Where I put “Commons” in brackets following the speech title, it of course indicates that the speech was recorded by Churchill subsequent to its date of delivery in the House, as there was no audio recording of Commons proceedings in Churchill’s day. That first occurred on 3 April 1978, long after Churchill’s days in Parliament. I add, as a point of interest, the fact that video broadcasts of proceedings on the floor of the House began on 21 November 1989. Note, finally, that I have not included other 33 rpm albums which state that they include Churchill speeches or extracts without identifying them. Thus, for example, the BBC Scrapbooks for 1940 and 1945, and several of the Edward R. Murrow I Can Hear It Now albums (issued on 78 rpm and 33 rpm records). I have not been able to listen to them all in order to identify the speeches in question and so have opted to not identify those collections of speeches. 80 rpm: HMV D379. [Corresponding speech by H.H. Asquith on reverse. 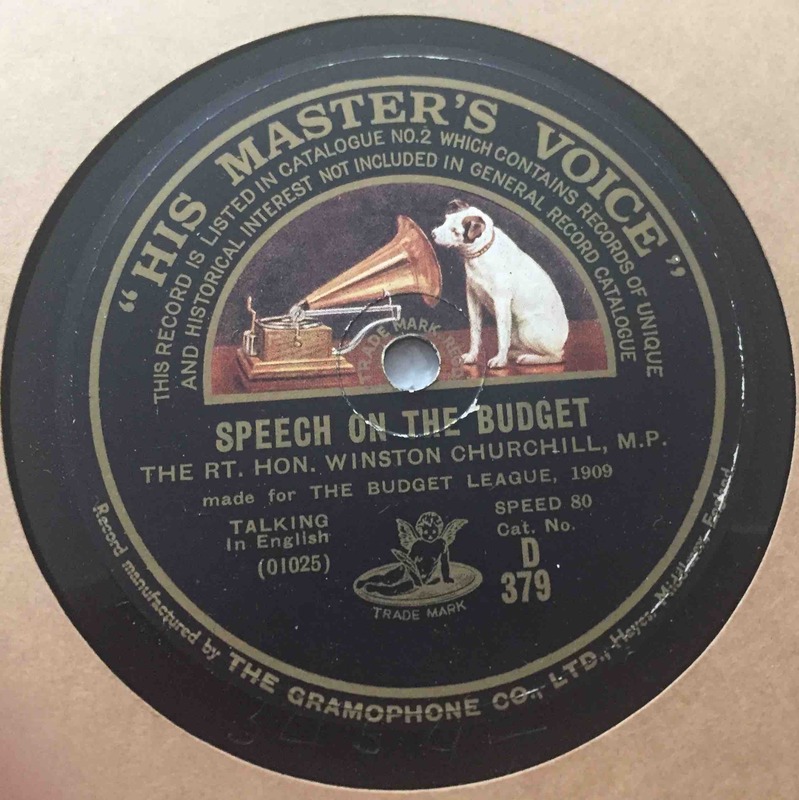 Note: that there is also a HMVD381 “companionˮ recording with a speech entitled “Land and Labourˮ by Josiah Wedgwood on one side and “Speech on the Budgetˮ by Lloyd George on the other. I expect that there is an HMV D380 recording as well; all may have been recorded with a view to the January 1910 General Election.] 33 rpm: Rococo 4001. An interesting commercial photo label, pictures Churchill. On the other side is a Roosevelt speech with an image of the President. 33 rpm: Decca 5, London XL.10, Caedmon TC 2018, Decca LXT 6200; Tape: Decca KSXC 6200, Argo 1118; CD: Alanna, BBC Audiobooks, This England, ProArte. Handwritten note on a BBC label, one of a dozen known to the author: “In a Solemn Hour,” Churchill’s first broadcast as prime minister, occurred on 19 May 1940. An exceedingly scarce Washington, DC press conference “Special Record,” not for commercial resale. The press conference was held on 23 December 1941, the day before Churchill’s broadcast during the lighting of the White House Christmas tree. 23 December: “One Man and One Man Only” [CS: “Press Conferenceˮ] [Washington, D.C.]. Gramophone Album No. 348: The Progress of the War: Broadcast Speeches by the Prime Minister The Rt. Hon. 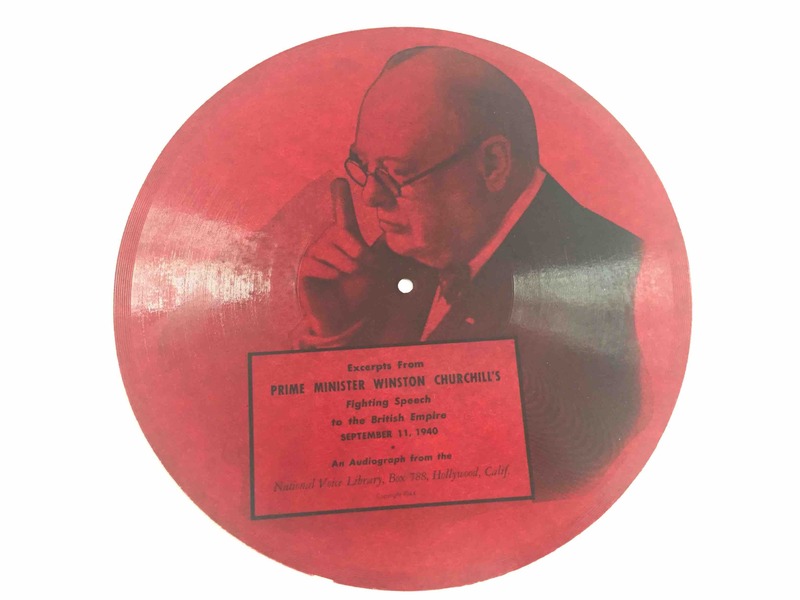 Winston Churchill, M.P., [Volume One], May to September 1940; Gramophone Album No. 356 The Progress of the War: Broadcast Speeches by the Prime Minister The Rt. Hon. 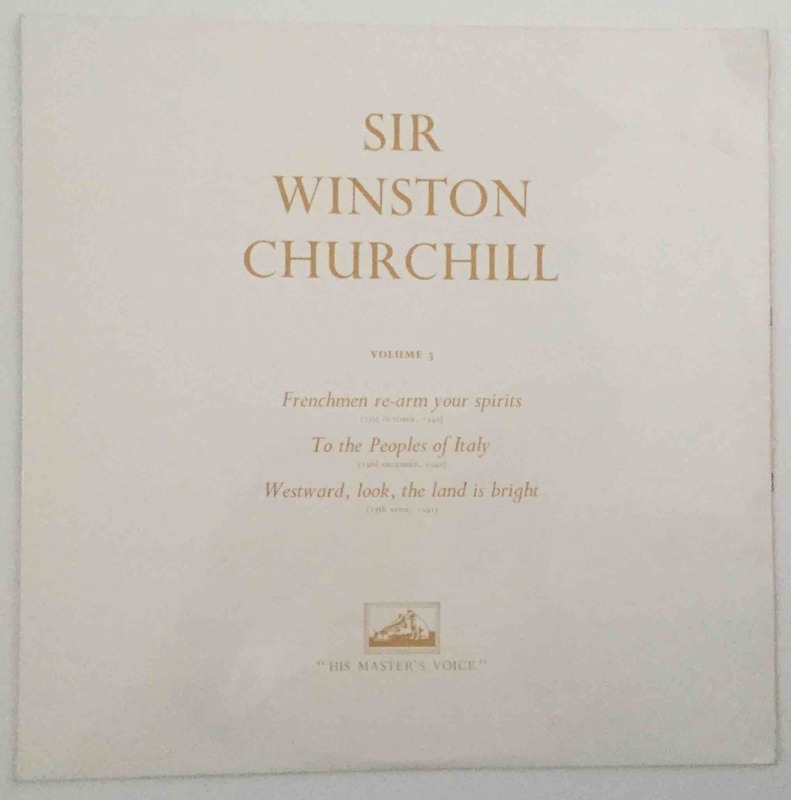 Winston Churchill, M.P., Volume Two, October 1940 to February 1941; Gramophone Album No. 364 The Progress of the War: Broadcast Speeches by the Prime Minister The Rt. Hon. Winston Churchill, M.P., Volume Three, March 1941 to August 1941. 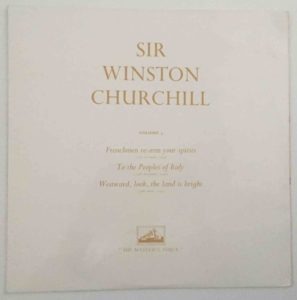 An example of the EMI eleven-disc set of speech recordings issued at the time of Sir Winston’s death. These are often confused with, but are different in content, from the London and Decca twelve-disc sets.